The "Flatwoods Monster"... 63 years! Subsequently, Feschino writes books and composes varying treatments regarding the eerie Flatwoods case and, for years, travels many thousands of miles throughout the country giving well-received lectures, having tireless book-signings and giving jaw-dropping interviews. As a result, of his effort Feschino and his remarkable study has been featured in newspapers, magazines, radio programs, television news broadcasts, one History Channel TV program, forgetting countless Internet articles. Such is so! Why this ever-smoldering, if outre and unsatisfied, interest worldwide? ...Air War with ET, reader... It is as wholly unimaginable as it is unimaginably unacceptable. ...But for the data, it would be laughable and forgotten out of hand. This is just to start. Remains, the "Flatwoods Monster" is brought back into the media spotlight once again... after all of these years! The patient reader discovers yet another piece of "Flatwoods Monster" history returned to view! This aforementioned item involves a significant key part of the incident: the curious misrepresentation regarding the physical appearance of the so-called "monster," from the beginning! 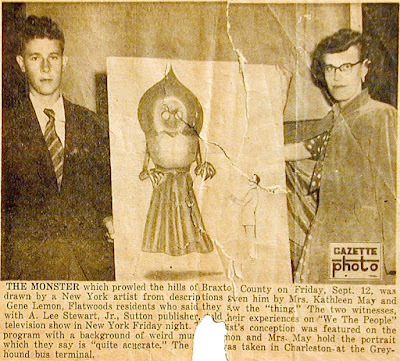 Recently, the Braxton County Convention and Visitor's Bureau disclosed that the original 1952 drawing of the "Flatwoods Monster" has actually resurfaced in Braxton County! This famous and wholly familiar drawing was shown on the ill-fated TV program We the People during a live episode hosted by Daniel Seymour mere days after the Flatwoods event. We the People, the penultimate Flatwoods Edition, would air on September 19, 1952. Thought to be lost or destroyed many years ago, this original piece of historical art has actually been safely tucked away behind closed doors by owners wishing to remain anonymous. They have come forward, at last, more than 60-years later; however, to graciously allow the drawing to be seen and photographed for posterity. This, reader, is actually the first time that the original black and white, if lightly colored, drawing has been seen in public since the early 1950s. Furthermore, it can now be seen in high-resolution, not the grainy reproduction photographs available over the years in the flurry of first appearing and various newspaper articles. Additionally, the new 2015 photograph, taken in color, reveals a crucial detail: the head and eye area of the "monster" was actually colored yellow to indicate an illumination from within the headpiece of the suit! This new revelation, now seen in the original drawing, is a very significant point, reader! It actually shows a detail of the "monster," told to the sketch artist by the two witnesses, Mrs. Kathleen May and Eugene Lemon, that was correctly interpreted in the drawing! See, the We the People artist had gotten everything else wrong! No! The monster was not a West Virginia mountain Nixie in a Darth Vader cap and sweet sixteen skirt... nor did it have grasping arms ending in claws! It was a mechanism! Some back-story regarding the famous 1952 drawing of the so-called "monster" is in order. The figure, a reader discovers, was inaccurately and so more dismissively portrayed at the start and for better than half a century... until Feschino, our intrepid and highly trained near-forensic illustrator, became involved. 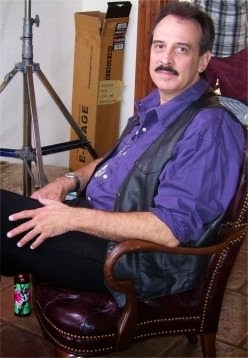 During his investigation into the Flatwoods incident beginning back in 1991, and after a long hard slog to win the trust of journalistically betrayed witnesses and humiliated—so outraged locals—Feschino worked closely with many of the persons actually involved in the incident, first hand. He talked with the May family and many others including A. Lee Stewart, Jr., first responding co-owner/reporter of the Braxton Democrat newspaper and Colonel Dale Leavitt, war hero commander of the West Virginia National Guard in 1952. Frank talked with, otherwise interviewed, and visually recorded the testimonies of first-hand witnesses, typified by matriarch Mrs. Kathleen May and her son Freddie, numerous times over the years about their close encounter with the "Flatwoods Monster." He also worked with and later videotaped Stewart at his home in North Carolina. Frank additionally talked with, and taped for the record, Colonel Dale Leavitt on the Fisher Farm in Flatwoods about his substantive involvement in the case. The Colonel had actually become involved in the incident after receiving a call from the Air Force on the 12th, the fateful night in question. He had been ordered to the encounter site with a battalion of troops carrying everything from boats to bazookas! Does this sound a little more involved than mere alleged crowd control for thousands of curious rubberneckers and thrill seekers? It was. More on the Colonel later. Moving along as there's ground to cover, Feschino then transcribed all of these interviews into his books. 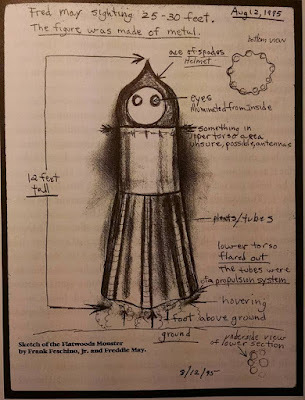 With his permission, I will explain what Kathleen, Freddie, Colonel Leavitt and Stewart told Frank about the 1952 drawing and the true appearance of the so-called, "Flatwoods Monster." Revealed! The 12-foot-tall figure was NOT a claw waving mountain haint wearing a cloaked hood and a pleated dress as depicted on the We the People television show in 1952! As history records it, the reader discovers that the far-reaching tale of "a giant alien seen in Flatwoods" had gained the attention of a popular television talk show in New York City titled, We the People. New York! The curious misdirection had its start there. Really, yes people, after only five days! New York! The Terror on the 12th! Shifting gears, in 1996, Feschino talked to A. Lee Stewart, Jr. at his home in North Carolina, where the video interview had been taped. It was the first such interview Stewart had done since 1952! Stewart, remaining sharp as a proverbial tack, recounted his considerable participation. On the night of the incident, Stewart was called by the West Virginia State Police and asked to go to the May home on behalf of those police because those State police were unable to get to the area. See, something else, apart from the current story, howsomever related, had the State Police "occupied." I'll say no more about that than "cue the ominous music." UFOs were in abundance and all over the United States coast to coast and border to border! The police were, at the same time, "occupied." The music climaxes! Back at the ranch, literally, the story continues as Stewart was the first person of officiality and authority to reach the May residence, hard-boil the witnesses, and actually go to the site of the fresh encounter on the Fisher Farm. On site, he smelled the sickening sulfur odor, saw the disturbances in the field at the nearby landing site and later found a piece of debris in the form of a melted metallic-like substance. Most strikingly, he saw the fear of the witnesses. Why was Stewart contacted, one might ask. Stewart, a former Air Force veteran and respected photojournalist in Braxton County, owned a very sophisticated professional camera for the time, and over the years had received many a call from the police to accompany them to various accident and crime scenes to take photographs. Additionally, Stewart also broke the event to the Charleston Gazette later that night on September 12, 1952 and was justifiably credited with the story. Mr. Stewart would be tasked and began handling the public relations through his newspaper, the Braxton Democrat which he'd owned in part. He received calls from around the world! On September 18, 1952, Mrs. May, Eugene Lemon and A. Lee Stewart were subsequently flown to New York City as guests of the hugely popular TV talk show hosted by Daniel Seymour alluded to and stayed at the luxurious Belmont Hotel. That afternoon they were driven to the TV studio for the live broadcast scheduled to air live later that evening. It was an extremely intense experience entirely out of the wheelhouse for innocently provincial West Virginians, to say the least. But then, they'd seen a "monster" and lived to tell the tale. Before the show, Seymour, his staff, and a sketch artist for the program sat down with May and Lemon, interviewing them pointedly about their experience. They asked them to describe the figure and appearance—some likeness—of the "monster." The artist sketched out the described being on a huge 24x36 inch illustration board—and rather too hastily reader, logically, given major newspaper articles had already preceded the arrival of the party from West Virginia, garnering New York's interest in the first place! No, the artist sure lost points for not producing what was described in print and person and of which he must have had some prior knowledge! I suspect that logic may be impeccable. Feschino asked, "Why did he draw arms on it then ...because you told me it had antennae?" May answered, "I told him that too, but that's what he drew on it. To make it look more like a monster, I guess..."
One must remember that Kathleen May, an educated woman of reasonable intelligence and by no means a "hillbilly" (one of the skeptibunky slurs she and her town would learn to endure over time), was still a country gal humbly provincial in a 1952 New York City, New York. ...With everything moving around Kathleen at the speed of sound relative to her and most people of the time? She was justifiably intimidated. See, where she was from, in Flatwoods, with a population of only 300 people and well before the interstates making travel more effortless, it took her hours of road time to get anywhere at all. Kathleen lived in a mountainous region where even the police sometimes couldn't get, at times, remember. Yes, reader, Kathleen May can be entirely forgiven for letting herself be pushed around by fast-talking New Yorkers, to a degree, with regard to the true likeness of the "monster." ...A deep Elizabethan bow to the memory of Kathleen May. The biggest misconception about the "monster," one is reminded, was of its overall appearance being described as cloaked in a dismissively inexplicable cloth garment, wearing a pointed hood and sporting a pleated skirt/dress like a fairytale figure. This was never the case. Besides, where were the rest of the Barbie-doll accessories and accouterments, doting Ken-dolls driving motorless sports cars and living in plastic beach houses? This is sarcasm not uncalled for, reader. I'll wallow in it, and thanks. ...Sometimes enough's enough, eh? Hurdles, howsomever unintentional to genuine enlightenment on a subject, especially the highly strange ones, become increasingly tedious and more difficult to bear as this writer ends the summer of his winter. I digress. See, the realistic portrayal of the figure was described to Feschino during his interviews and also described to Stewart back in 1952 was as a hovering mechanical device! ...Posted Monday, September 15, 1952, and, as pointed out above, and preceding the We the People interview (so they should have known)! The Charleston Gazette posted an article containing this information about the accurate description of the "monster." This was obtained by Stewart during his interviews with the witnesses back in Flatwoods. This article, "Braxton Monster Left Skid Tracks Where He Landed—(Special to The Gazette)," actually precedes the incorrect portrayal of the TV show "Monster" drawing... by five days! The witnesses gave the actual description regarding the "monster," at the start! We the People really can't claim an ignorance when it was this initial report crossing their interest threshold initially. It "Wore a suit of green armor. Looked like a mechanical man. Had a blood-red face. Sported a black, spade-like cowl which extended a foot or more above its head." Yes, Stewart got it right in his reportage. Media then and now, eh? Offset, back in the New York studio, the TV sketch artist finished drawing the "Monster" illustration and handed it off to a crew member to be used for the opening of the live TV broadcast show. Mr. Seymour had finished talking with May, Lemon and Stewart off camera, and the crew prepped them for their imminent interviews. Seymour strode out onto the set and took his place at center stage while the three Braxton County residents took their seats on set to begin their presentation. The show opened by setting the scenario with a soft narration while the orchestra simultaneously performed soothing background music. Seymour calmly began, "Imagine a scene in the autumn dusk, in a lonely secluded spot, which you reach right after viewing a fiery meteor in the sky. This was easy to imagine." Suddenly, another camera cut to the big drawing of the "monster," which was flashed on the screen as the orchestra music turned eerie, intensifying. Seymour, stated, "THIS WAS NOT SO EASY." At that moment, history was made as a shocked American public gasped at the sight of the "Braxton County Monster" on their nascent television sets for the first time! Verily, the picture was "a lie telling a truth," but real tragedy on further investigation, reader... enduring cheap-shots for the effect even in the beginning... chief among them regretted memories of the unreturning and forgotten pilots lost engaging those UFOs... through the wounded pride and sensibilities of the betrayed persons involved with the Flatwoods affair, to the ongoing disgrace of a media continuing to misinform us today! Still reader, the "monster" was seen for the first time, after a fashion, during that broadcast 63 years ago and remains in the public imagination—even apart from Feschino's efforts to make the story known himself—today! Sadly, then as sometimes even now but for Feschino's efforts, the "Monster" was incorrectly portrayed by the sketch artist this writer is compelled to reiterate to the reader. How? "The picture in question that always seems to be in a lot of the articles that've been seen is the one right here. The artist at We the People drew that in New York on the actual day we were there. In fact, it was the focal point of the entire show. They started interviewing Mrs. May, and then went to Lemon, which was all a question-and-answer situation. They gave me the opportunity of summarizing the thing [story] in general and then again finished with this particular picture. That was basically the entire program." Mrs. May told Feschino the following information about her interview on TV, "They asked me if I knew what it was—you know [pauses] and Lord I didn't know... I had no idea. I know it wasn't an airplane. That's the only thing I'd seen in the sky besides a kite." Now reader, let us fast forward to Feschino's investigation and explain his work and findings regarding the witnesses with which he toiled. Remember, Feschino is a trained illustrator who graduated with a four-year diploma in illustration from the prestigious Paier School of Art in Hamden, Connecticut. Frank's training is not to be taken lightly as he was coached by some of the best artists and illustrators in the world, including Kenneth Davies, Rudolph Zallinger, and John Massimino. Let this writer proclaim that it was Feschino who sat with the witnesses and talked for countless hours, questioned them, and otherwise interviewed them about their close encounter. Most importantly reader, Feschino also sat with them and drew police-style forensic drawings of the "monster" from their descriptions... the correct recollection! Subsequently, from his drawings and sketches, Feschino made comprehensive and detailed drawings of the "monster" and later composed detailed paintings from them. His due diligence work, tireless investigation, and talented illustrations results in a perspicaciousness several orders of magnitude ahead of the artist from the We the People program... who too quickly hashed out an incorrect drawing depicting the 12-foot-tall giant as a claw waving "monster" inexplicably floating and wearing a dress. That's "built-in" deniability! Is this picture resolving yet, reader? At this time, we do not know the name of the artist, but we know he didn't get it right. Off-set with the witnesses maybe the artist was rushed and under pressure to finish the drawing prematurely. Maybe he was instructed by the producers to make it look like a scarier monster for impact effect... or maybe he just totally had misunderstood the witnesses during the pre-talk interview. I point out above how unlikely all that seems given some foreknowledge... Regardless of the reason, the drawing was not portrayed correctly and it almost stuck... to the significant chagrin of principal persons... who? 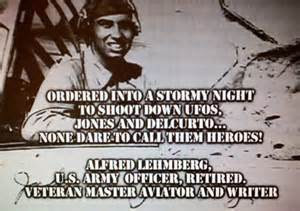 ...Ask the families of 2nd Lt. Jones and 2nd Lt. Del Curto, two USAF jet fighter airmen who vanished during 21-plus hours of continuous UFO activity on September 12th, the night of the "monster" encounter in Flatwoods, to begin to appreciate the enormity of this, even innocent, error. they were operating. They were never seen again. 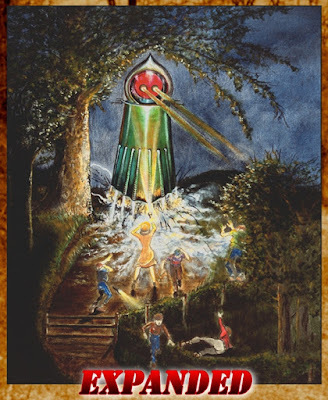 Author/illustrator Feschino concludes, "When Mrs. May and the boys encountered the 'Flatwoods Monster' on the Fisher Farm on September 12, 1952, an alien being may have been inside of a large hovering probe or space suit, making it the reported twelve feet tall. The height of the figure witnessed was gauged by a tree branch under which it was seen. 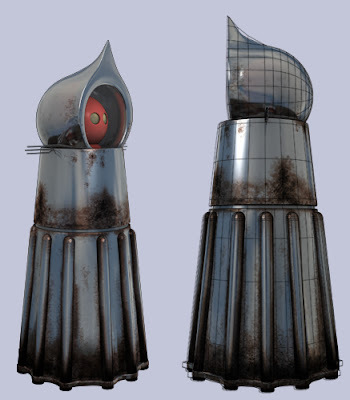 This mechanical, metallic-like craft was more likely a shell with a propulsion system located at the lower torso. The color of the upper and lower torso areas was described as looking like the color of aluminum. 2. INNER HELMET. Set inside the black outer helmet, was a red-colored interior helmet that had two large porthole eye openings. It was "worn" by the occupant. The neck area consisted of some sort of collar covering and this inner helmet rotated upon this collar. 4. LOWER TORSO. The lower torso flared out from the waist area to the bottom area. The bottom area was said to be approximately four feet across. Set upon the lower torso were thick pipes situated vertically and equally spaced around the lower torso. They were described as being silver in color and as thick as a fireman's hose. The pipes seemed to be the exhaust outlets for the propulsion system capable of lifting the large fabricated unit. Now reader, back to the original 1952 drawing, which is the focal point of this article. After the TV show, the three Braxton County residents stayed briefly in New York and then were flown back to West Virginia. Mrs. May was given the original drawing. This she hand-carried with her back on the flight to Charleston, WV. She told Frank, "When we got off the plane down there in Charleston, Lord, there were photographers and everything else. They had taken pictures of me, and they were all waiting for us." The trio was taken to the Charleston Greyhound Terminal for their long trip back to Braxton County and Flatwoods. There, a Charleston Gazette photographer that followed them from the airport took this photo of Mrs. May and Eugene Lemon. This photo, as A. Lee Stewart pointed out to Feschino, has appeared in countless publications. Their ordeal, which would last for decades, was just beginning. Upon their arrival back home in Flatwoods, A. Lee Stewart continued to handle the public relations and acted as the spokesman who dealt with the media through his newspaper. The story was not containable. 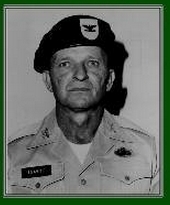 Mrs. May also told Frank about an incident involving the West Virginia National Guard commander the reader will remember, Colonel Dale Leavitt of Sutton, a bonafide hero of WWII. You didn't become CIC of the State Guard without a certain competence, eh? Her meeting with Leavitt occurred in her house, which is near the farm, shortly after she returned home from Charleston that afternoon. All week long, Colonel Leavitt and groups of troops had been deployed on the Fisher property allegedly to control the large crowd of curiosity seekers and news reporters who were overrunning the farm and town. Upon her arrival home, Mrs. May explained the meeting she had with Colonel Leavitt and what curiously unfolded involving the drawing she had in her possession. During an interview with Feschino, she reported, "I hadn't been home too long until this truck came up and it had all these troops and everything on it, and Dale came in. He asked me if he could borrow the picture and he took it out and showed it to all the boys [troops]. After a while, he came back in and said, 'Well, I want you to take a look at this' and he just turned it sideways and said, 'this is a complete missile.' "
The aforementioned missile is another reference to the 1952 drawing showing that Colonel Leavitt had actually held the illustration in his hands and displayed it to his troops as some kind of briefing aid! He's turned it on its side to illustrate his supposition of the object as a mechanism. 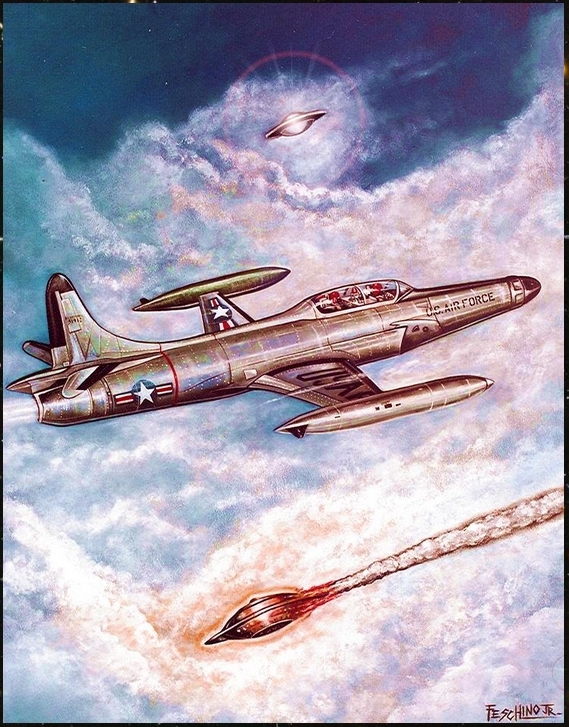 It also shows that even though the drawing was inaccurate, Leavitt already knew that it was something mechanical, some type of machine or rocket! Remember, Leavitt, by his report, was tasked originally to collect leaked "oil" deposits and "debris" from the farm that night during a covert mission. He also noted, "the [noxious] odor of burning celluloid" as he supervised that operation. He also talked to Mrs. May and all of the other witnesses in the days following the incident and stated, "Their stories are all identical." During Feschino's interview with Leavitt on the Fisher Farm, Feschino asked: "Do you think it was an experimental CRAFT [of human manufacture], or do you think it came from someplace else?" Leavitt replied, "No... I think it came from someplace else..."
When pointedly drilled by Feschino, "What do you think happened here?" The colonel answered, "Well, there was something here that could fly backwards—or wherever they wanted to go. Just anywhere, I think—As long as they don't tear up their equipment! It was right here." Yes, reader, Colonel Leavitt knew it was not a monster, but a machine. ...What was the Colonel out there to actually search for? Why did he have boats and big caliber weapons? We can't know, as yet. 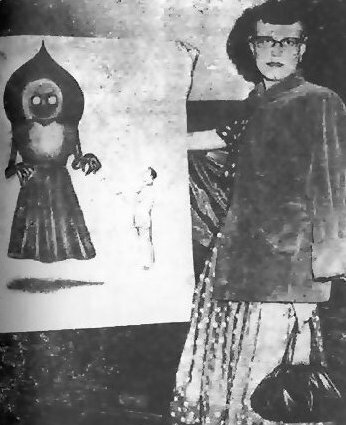 Subsequently, after the TV show, several more newspaper and magazine reporters set upon Flatwoods and interviewed Mr. May while several more photographers took photos of her in her home with the We the People "monster" drawing. This would become a harassment over the years and a reason Feschino had such a hard row in the township, initially. "...Then Mrs. May and the Lemon boy appeared on We the People and retold their frightening experience. It was obvious they believed the monster was real, and a dozen papers and magazines sent writers to Sutton [the nearby Braxton County Seat] for new angles on the story." No "ghosts," "haints," or Roc sized barn owls, then, eh? 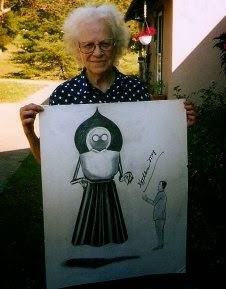 Today, some of the photos taken of Mrs. May with the original 1952 drawing can be seen in numerous publications and although it is incorrect, the original drawing has become a part of history regarding the "Flatwoods Monster" incident and endures as a legacy of the highly strange for that reason. Time marches on. 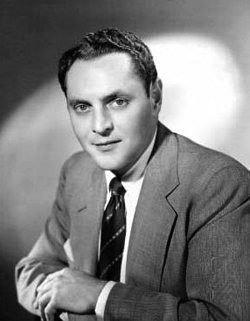 Epilogue: The format of the We the People show, which was first telecast on June 1, 1948, was to interview various guests about important events occurring in their lives. Ordinary people, celebrities, entertainers, and politicians alike were informally interviewed by the host, who would casually chat with them on the set. This informal talk show format made We the People one of the most popular TV shows of its time. At the beginning of each segment, the guests were introduced with the opening line, "We, the People...speak." Yet, after airing the "Flatwoods Monster" story on September 19, 1952, this popular show was summarily and inexplicably cancelled after the telecast of only one more program. Highly strange, on September 26, 1952, the show made its final appearance on NBC TV. 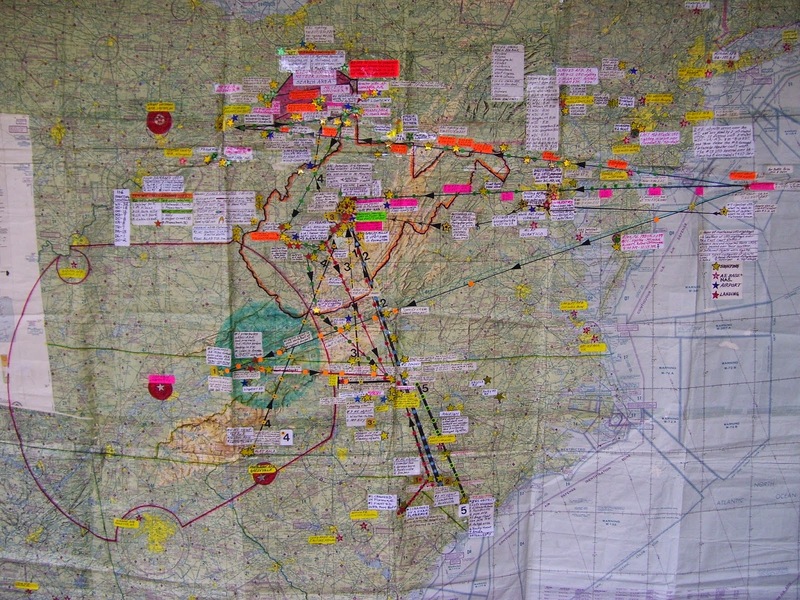 Remember that Feschino is able to segregate these numerous objects sighted, in fact, by their shapes, sizes, colors, manners, locations, flight paths and sighting times along a trace of their flight's route! A picture forms when one knows what was where, when. He discovers that a jaw-dropping twenty-five different unidentified objects—yes, 25 UFOs—had actually passed over the following ten eastern States: Delaware, Maryland, North Carolina, Ohio, Pennsylvania, South Carolina, Tennessee, Virginia, Washington, DC, and West Virginia. CSI's Papa Joe Nickell doesn't mention any of this, does he. A statement not a question. Nor does anyone at CSI Central. Not even brought up to be debunked, it's not party line over there. Not dismissible so it's scary too—it's a thin ice for the traversing skeptibunky. One false step and it's through the ice and drowning in data. Back at the ranch, the overwhelming amount of UFO sightings revealed by Feschino on that day have come to be known as the "September 12, 1952 Flap." This flap is actualized by examining the flight characteristics of the UFOs many witnesses described as having been on fire, exploding with pieces falling away, making strange in-flight noises, flying erratically at tree top level, and making crash-landings. They sound busy. The article also states, "In Air Force parlance, this means that if a 'flying saucer' refuses to land—jet pilots are authorized to shoot them to Earth, if they can get close enough to do so." Was there ever a more nuanced declaration of war? 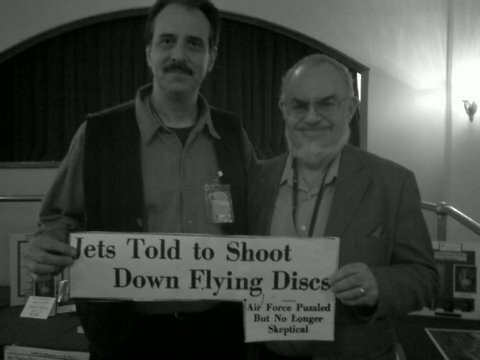 During 1952 the USAF received the most recorded UFO sightings made to Project Blue Book in its 17 year existence! 1,501 official reports with 303 of these bona fide "Unknowns" ...meaning visual conditions were such that they should have been able to tell what the flying object was... and couldn't! Yes reader, with these overwhelming numbers, the Air Defense Command never had a better opportunity for getting a UFO. On that hot Indian Summer day of September 12, 1952, they got their chance! Painstakingly thorough in his on site investigations, Feschino discovers that there were many more sightings than the original investigators were aware of—many, many more, reader, as pointed out above. One of the original investigators, Gray Barker, stated, "I can only begin to cope with the mass of data and correspondence, the pieces of the jigsaw puzzle containing the answer to the mystery—if only it could be put together." Feschino would make that wish come true. At this point the majority of information concerning these UFOs descending over this three state area was found only by Feschino in Project Blue Book—no one besides Feschino seems to have ever bothered, apparently, to closely read the entire September 12, 1952 case files! Now, for the record—Feschino discovered that there were actually twelve craft descending to follow the damaged craft west before ascending back into the sky to the north and northwest! Who says so? Reported What, Where, and When says so. Blue Book says so. Contrarily, there is no official scientific documentation of reported meteor activity for that day anywhere in the world! In other words, neither the astronomy record books and sky watching clubs have any record of a meteor or meteor shower occurring anywhere around that day. Yes, the assertion here is that these additional craft were a full-blown search and rescue operation made by ET. Anyway, it seems at least one newspaper, The Boston Globe, reported it remotely right in their headline, "Four States 'Bombarded' by Meteor-Like Objects." In part, it was reported, "Authorities sought an explanation today for the flurry of meteor-like objects sighted over four states." 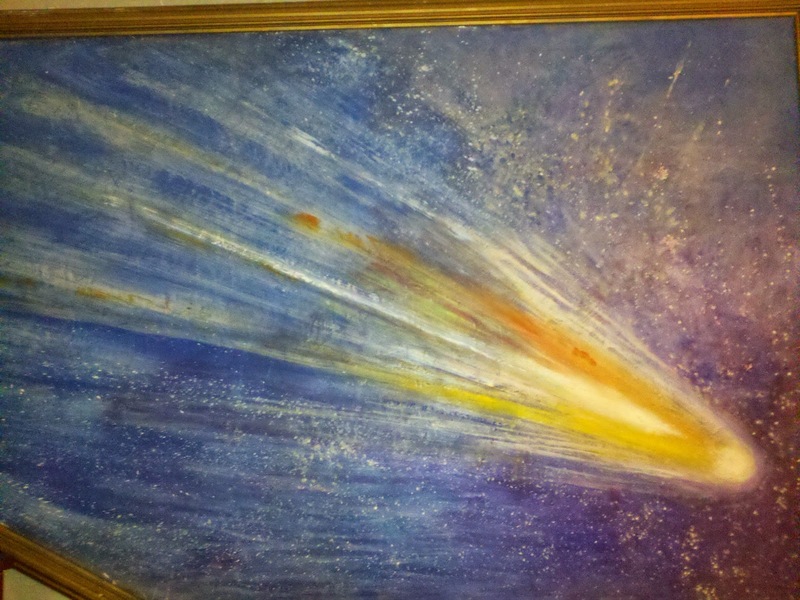 Meteor "like," good reader is the admission that they are not meteors or they would be meteors; they are like meteors so a listener can have any idea at all what's being related to them. Like a thing is not a thing. No, it's well and truly weirdness! 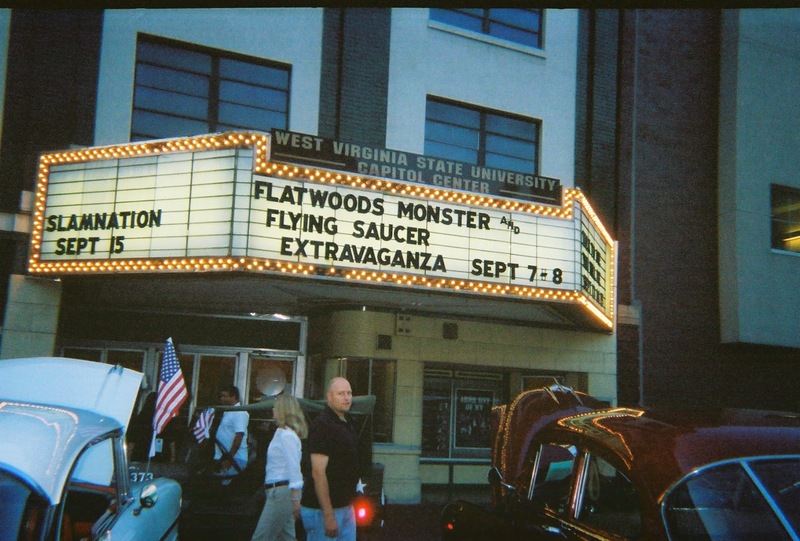 Flatwoods, WV, the geographical center of the state, void of any nearby USAF bases and isolated, was actually the designated area for two of the heavily damaged UFOs to meet and go down together consequent to their conjectured rescue. More specifically, the exact rendezvous point was actually the Fisher Farm plateau, located at the back of the farm known as the hill top. Before any of the sightings had occurred over Braxton County, specifically Flatwoods, the first UFO observation actually occurred over the Fisher Farm at about 6:50 p.m. EST. This UFO was a huge cigar-shaped object that flew from the east, passed over Harrisonburg, VA, then passed over West Virginia, flew toward Flatwoods and passed over the back plateau of the Fisher hill top. Here, Feschino and his military colleagues (myself among them) have agreed that this was perhaps a reconnaissance rescue craft that could conceivably have dropped a homing beacon device of some type for the two damaged objects to follow in to the farm landing zone. Remained, there was a real big problem during this time frame for the UFOs. 1). Ben's Run, Har—near Newville. About 6:45 PM. A large cigar-shaped red object also described as being shaped "like a bottle gas tank" and about 40-feet long, flew slow at a very low-level just above the tree tops at Ben's Run. Several residents on both sides of Har saw it pass over the town; some saw it pass over the general store and others later watched it until it disappeared over the tree tops in the direction of Flatwoods, about four miles away. Reconnaissance Rescue Craft #1 Witness: Multiple witnesses in Har including Donald Morrison and his family. 8). Flatwoods. 7:25 PM. A large fiery oval-shaped object flew south overFlatwoods, passed over the school playground, turned, redirected and then landed on the back hilltop of the Fisher Farm. Damaged #2 Craft - Flatwoods Monster Witnesses: Numerous boys on school playground and adult witness Jack Davis. There you have it people. ...Anyone still think all this activity was attributed to a single course changing "fireball meteor," as the USAF counsels via Blue Book or that the "Flatwoods Monster" was a Barn owl in a tree? Return to the clue queue if true. Wrapping up, let's remember two missing airmen, fighter pilot John A. Jones, Jr. and radar operator John DelCurto. 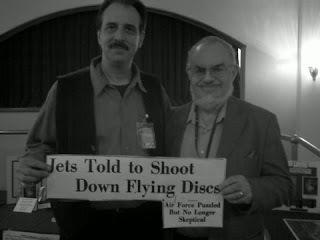 These two intrepid airmen, initially denied to Feschino by the Air Force as having ever even served (outrage), vanished into thin air with their F-94 Starfire during the onset of the September 12, 1952 UFO Flap, never to be seen or heard from again.